The Bank Buildings, Castle Street, Belfast was built in 1785 and was originally known as the Bank of the Four Johns because the four founders shared that Christian name. The bank collapsed around the early 1800’s and became the residence of the Church of Ireland Bishop of Down and Connor. Interestingly or gruesomely, depending on your outlook, the area directly in front of the building was used for public executions until 1816. 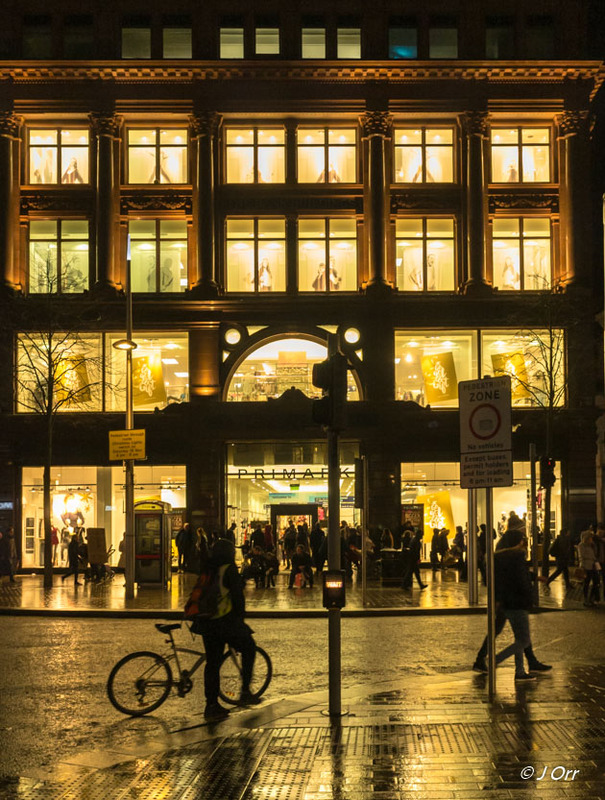 In 1853 the building was taken on by a wholesale drapery company and later became a retail department store with the upper floors being used as wholesale and warehouse area. It was bought by House of Frazer in 1969 and later Boots the chemist. 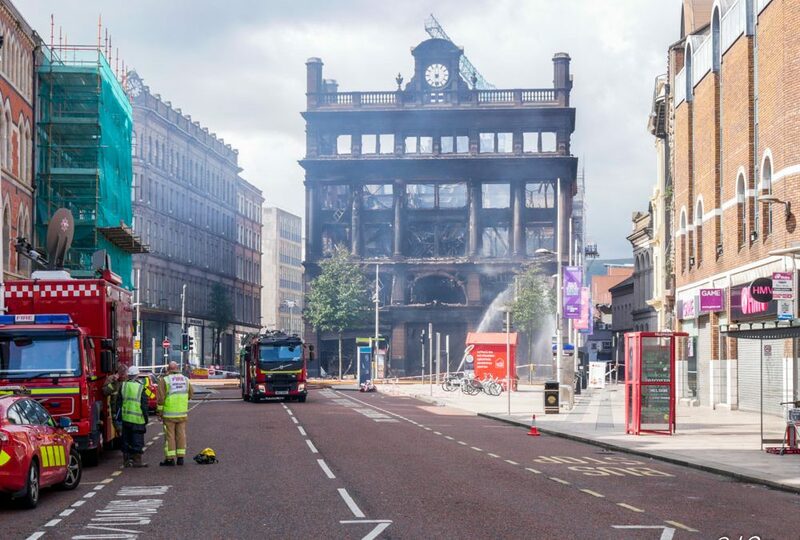 Boots moved out in 1975 when the building was badly damaged by fire after an IRA bomb and the present owners, Primark took possession in 1979. On 28 August this year fire broke out on the fifth floor. I photographed what was left the next day and it was only today while tidying up some of my photographs I came across this photograph that I had taken on the run up to Christmas 2016. The after the fire photograph is at the bottom. 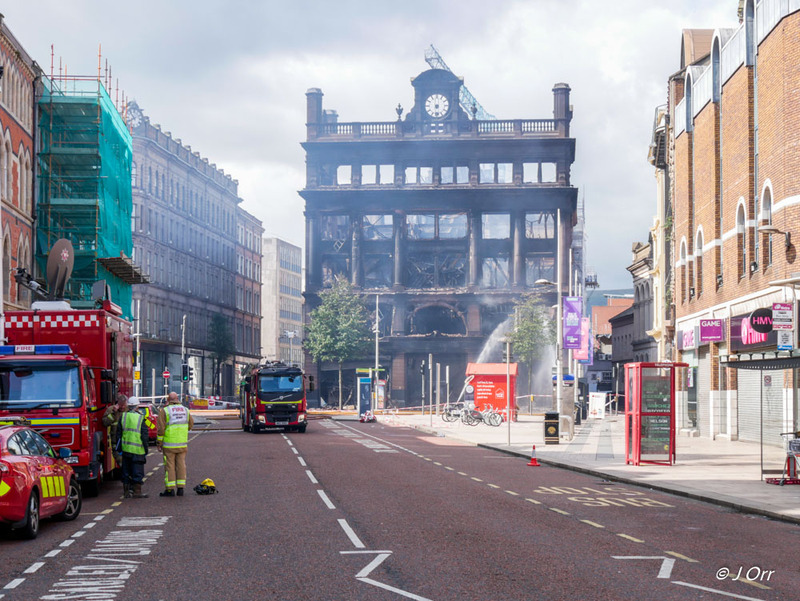 Thankfully there were no injuries but the staff at both Primark and neighbouring businesses are now faced with an uncertain future. The surrounding area has been cordoned off, as the building is unsafe, with premises inside the cordon having to close. Pedestrians and traffic have been diverted, further reducing footfall to the nearby shops that have been able to continue trading. There has been a campaign involving some local celebrities to promote the city and the council has committed funds to ease things but its a situation that is going to affect the livelihoods of many people in these already uncertain times with Brexit on the horizon.